Gina’s due to foal in mid-to-late April, which somehow seems both terrifyingly soon and impossibly far off. One of the things I’ll need to do when her offspring is born is register it with one of the various warmblood registries that it ought to be eligible for. One of Gina’s daughters. I’ve met this one as a grown-up! As I’ve mentioned before, one of the reasons I chose to breed to Mannhattan is because he’s approved for ISR/Oldenburg NA. Gina’s approved, too- she was approved long before I bought her, and her previous offspring have been registered with ISR/Oldenburg NA. However, Mannhattan is not active with ISR/Oldenburg NA; according to the organization, his offspring are eligible for registration, but require a letter of parentage verification and a DNA test. I don’t anticipate that being a problem, but learning that made me take a deeper look into what some registries require for foal registration. Mannhattan is currently active with the German Oldenburg Verband and Westfalen NA/RPSI, so I looked at those registries in addition to ISR/Oldenburg NA. Presentation at an ISR/Oldenburg inspection the year it’s born. This shouldn’t be a problem, as there’s a farm near Oklahoma City (~2 hours from me) that usually holds an inspection in the fall. Out of a mare entered into one of the Registry’s Mare Books. Done! Gina is entered into the Main Mare Book. By a Registry-Licensed or Approved stallion. Done, as long as I provide the letter of parentage verification and DNA test. Presentation at a GOV inspection. The stud that stands Mannhattan hosts an inspection in the fall; it’s about a two hour drive. Both parents are GOV-approved. Sire is approved; dam is not. 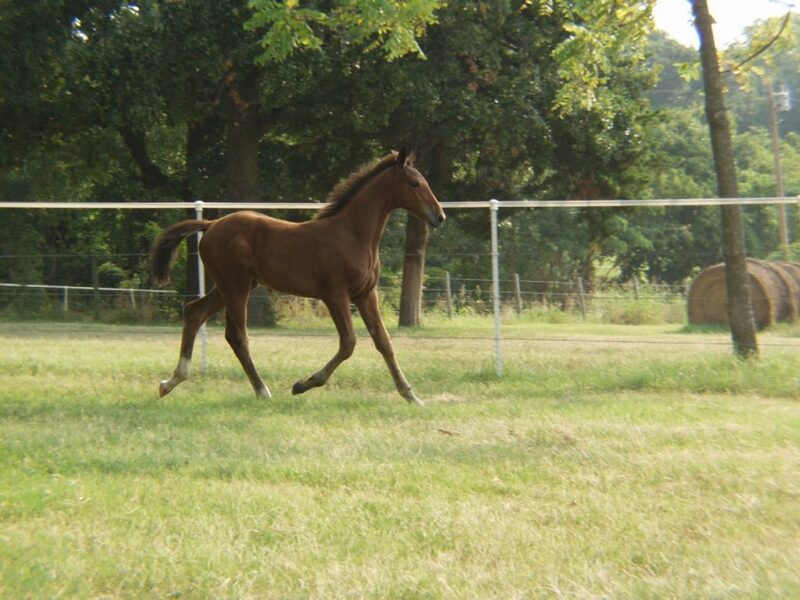 Gina would need to be inspected and approved in order for her foal to be registered with GOV. I have no idea if she’d be approved. The GOV’s rulebook states, “Although we will continue to accept TB mares, they must be of high quality, both mentally and conformationally, have very good elastic and flowing gaits, and preferably have competed well in sport horse disciplines.” Gina has lovely gaits, good conformation, and is mentally pretty solid (despite all the joking on her I do), but she certainly hasn’t competed at high or notable levels of sport horse disciplines. Somehow, I don’t think being Introductory Level Schooling Show Champion is what the GOV is looking for. Presentation at an inspection. This ought to be a piece of cake, as there are two inspections in Oklahoma, one of which is less than an hour from my house! By a licensed stallion. Done, as Mannhattan on the roster of the Westfalen NA/RPSI Studbook I. Out of an eligible mare. Gina is eligible for approval by Westfalen NA/RPSI; her inspection results would determine which book she would be entered in. Provided the judges didn’t find her completely hideous and she was entered into Mare Book I or II, her offspring would be eligible for German papers and a full brand. As you can see, none of the registries differ significantly from one another in either requirements or cost. I will probably register the foal with ISR/Oldenburg NA simply because it’s easier, and I won’t have to get Gina inspected. However, I’d welcome your input! Do you have experience with any of these registries? Do you prefer one over the other? For you Westfalen would be by far the easiest. GOV has the most “presitige” but they’re also quite hard on TB mares. If you were presenting a colt that was a possible stallion candidate, or if you were a professional breeder, I would say GOV, but since you’re presenting a personal riding horse, definitely Westfalen. It will be more relaxed, they’ll like your mare more, and – as a rider, not a professional breeder – you’ll get much more applicable feedback on your mare and foal. Old/NA lost all clout with me, and most everyone else, when they decided to bend the rules of the studbooks to suit a particular stallion owner. They turned themselves into a bit of a joke. Westfalen is by far the best of those 3 registries to work with. I’m confused/ignorant about breeding stuff…you mentioned the ‘transfer fee’ for the ISR/Oldenburg NA registry, but isn’t Gina already owned by you? She is owned by me, but “unofficially” as far as ISR/Oldenburg NA is concerned. As far as their records show, she’s still owned by Grand Oaks Ranch Sporthorses because she’s never been transferred to a different owner. I can understand why none of her previous owners bothered- they were using her as a riding horse, not a broodmare. Gina’s also got a lifetime USEF registration, but I’ve never put her into my name, so as far as they know, she’s still owned by the family that donated her to the therapeutic riding center I bought her from. Wow. Registering with other breeds is expensive! All I could think of when I read this was that you were going to have a baby registry for the new foal. LOL. Do people ever have showers for baby horses?! I’ve been kind of thinking about having a foal shower for Gina, haha! I don’t need people to buy things for the baby horse, but I think it would be a silly, fun excuse for a party. Sad brain moment — I got really excited bc I thought someone had invented baby registries (like what you shop off of) for baby horses. Maybe you’re on to something here. Gina would like to register for some Paddock Cakes, while Bambina would like an adorable foal halter and a soft brush for its sure-to-be-majestic tail. If it were me I’d do Oldenburg because it looks the cheapest out of all of them but I also am not very knowledgeable about any of the breed registries in the US.